NIBBLE. Fresh Gourmet makes the number one brand of croutons and salad toppings in the world: from premium croutons, to tortilla strips, nuts and fruit. 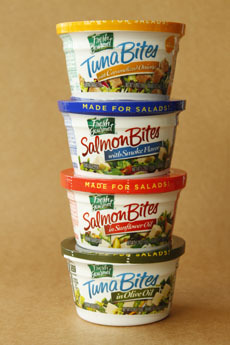 As we close out the year, we’d like to tip our hats to the company for its latest innovation: Tuna Bites and Salmon Bites. 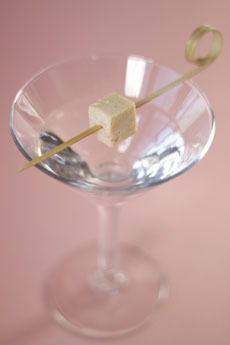 Made in Spain, the bite-size squares of tuna and salmon have the texture of pâté, firm enough to hang onto a skewer or cocktail pick. The flavor is more elegant than canned fish. We’d call them gourmet bites. The all-natural ingredients contain only tuna or salmon, salt, olive oil or sunflower oil, and flavors, and contain no other fish products. Tuna Bites are available plain or with caramelized onions. Salmon Bites are packaged plain or with smoke flavor. The company suggests them as salad toppers, of course: on a bed of greens, added to a seafood salad, and so forth. We love these little nuggets for the creativity they offer in garnishing, making snacks and canapés or other hors d’oeuvre. They make gourmet recipes for entertaining a snap. While the products are in limited distribution at the moment (see the store locator). The website offers a $1.00 coupon for signing up for recipe emails. We look forward to more creations in the new year. How would you use this little bites of protein? Find more tuna and salmon recipes. tuna garnish for a Martini. Delicious!